Automatic labelling system for cylindrical or tapered containers. 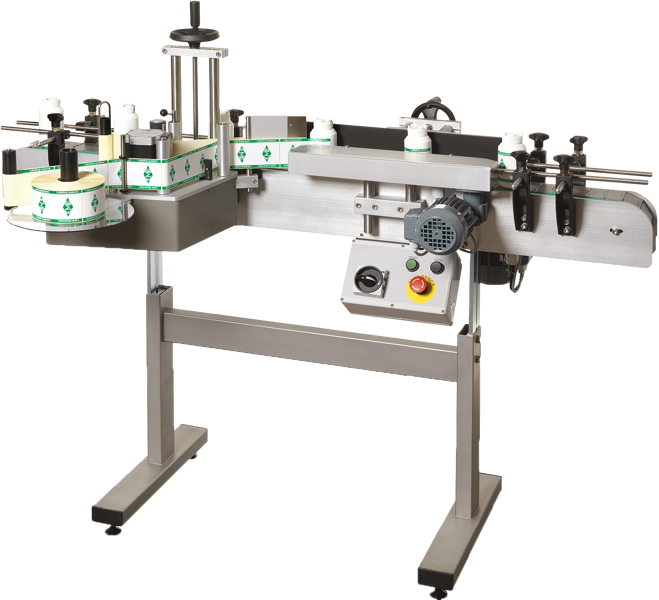 The WRAPROUND labelling system can be used as a stand alone unit or part of an integrated production line. Patch or full wrapround labels can be applied to straightsided cylindrical and multi faced glass or plastic containers. Labelling of tapered containers is made easier by the label head angle mount fitted as standard on all WRAPROUND systems. Plus with the addition of a vacuum pad, full wrap and partial wrap of tapered pots is made easy. Conveyors can be supplied in various lengths and widths to suit the product. Infeed and Outfeed tables can be incorporated with product separators and bottle dividers. The bottle rotation unit is adjusted by turnwheel for different diameter packs, thereby reducing changeover times. Backing pad has quick release facility for changing pad heights where labels are applied beneath tear tabs. Label head can incorporate a small or large area thermal transfer printer, Hot foil coder or Ink Jet printer for the printing of batch numbers, expiry dates, barcodes, pricing information etc directly on to the label prior to application. Label head: 120, 200, 250 & 300mm web widths, left or right handed. Label detection by P.E. cell or microswitch. Roll max, 240mm diameter, 45mm or 76mm ID cores. Conveyor: Width: 82mm upwards. Length: 2m upwards. Speed to suit product. Hot foil coder (optional): Print areas 12mm x 30mm or 40mm x 28mm. Variable temperature, dwell controls and ribbon indexing. Pneumatically operated. Thermal transfer printer (optional): Print areas 30mm x 40mm, 50mm x 70mm & 128mm x 70mm. Label design software & consumables. available to suit any product. Options: Product separator. Label counters, standard or pre-set to stop. Batch number and label verifiers. End of roll alarm/warning light. Services: 220/240V AC. 50/60Hz, 600 watt. Clean compressed air, 6 bar max. 8 litre/min. (In-line Coder Option). For cylindrical or tapered containers.